The premise of the Open Your Ears program was to use music education techniques to improve the listening and aural discernment abilities of the nursing students. Numerous short exercises were included in the two workshops and were based around the development of the following skills; the ability to both listen to sound environments and distinguish individual sounds (known as focus pulling), the ability to audiate or replay sounds in their minds and the ability to quickly ascertain the speed (tempo) of a beat. The pilot program was completed with two cohorts of Master of Nursing students at Monash University in 2012 and further funding to expand the program to paramedics and physiotherapists is currently being sort. Collins, A., Vanderheide, R., & McKenna, L. (2014). 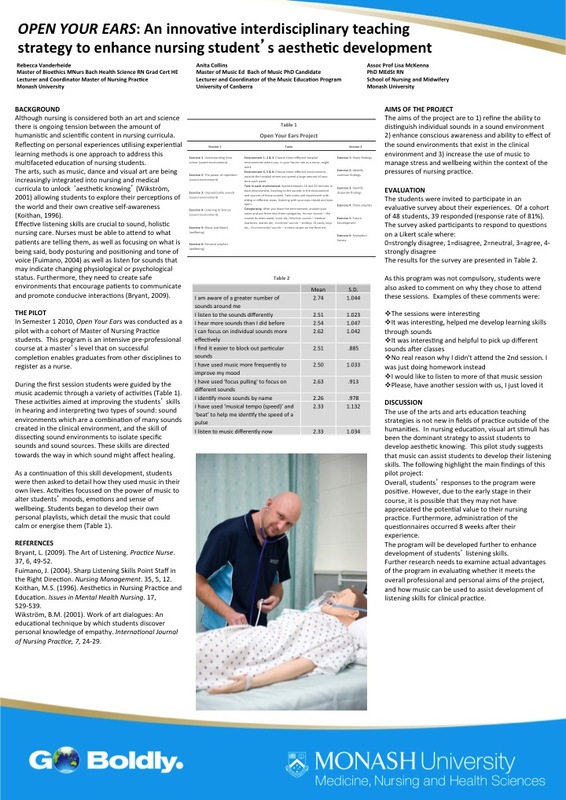 Hearing, Listening, Action: Enhancing nursing practice through aural awareness education. Contemporary nurse, 4737-4753. Vanderheide, R., Collins, A., & McKenna, L. (2013). Open your ears: Enhancing health professional students' aural awareness through innovation. Focus on Health Professional Education: A Multi-disciplinary Journal, 14(3), 98. Collins, A., & Vanderheide, R. (2011). The stethoscope and the stave: using music education pedagogies to enhance nursing education. In Making Sound Waves: Diversity, Unity, Equity: Proceedings of the XVIII National Conference(p. 57). Australian Society for Music Education. Collins, A., & Vanderheide, R. (2009, December). Open your Ears Project: Using Music Education to Enhance Aesthetic Knowing for Nursing Students. InInternational Conference on Music Communication Science (pp. 3-4).